The tale of The Boy Who Lived races to its epic conclusion in The Deathly Hallows, the seventh installment of J.K. Rowling's masterpiece. To commemorate this, Gentle Giant is proud to bring to you the Harry Potter Deathly Hallows Mini Bust. The 1:6 scale mini bust is hand painted and individually numbered and comes with a matching certificate of authenticity. At seventeen, Harry has experienced more pain and suffering than most do in entire lifetimes, and yet he's never lost the will to fight for good. 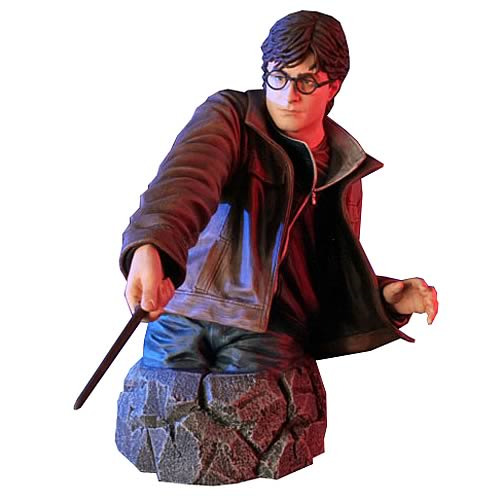 Based on Daniel Radcliffe's digitally scanned likeness to ensure the utmost accuracy, Harry is rendered here in high quality polystone warding off an incoming attack with a counter-curse as he battles Lord Voldemort and his minions. A must for any fan of the Harry Potter series. Limited edition of 950 pieces.